Cristina L.M. 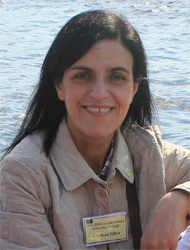 Silva is Associate Prof. at Portuguese Catholic University – College of Biotechnology (ESB). She is Chem. Eng. and PhD in Biotechnology and Food Engineering, and is involved in research on quality and safety of processed foods, with special emphasis on mathematical modelling and optimisation of the processes. She has been institutional leader of several national and international projects, and coordinator of the projects ISEKI_Food 3 and ISEKI_Mundus 2, and FP7 KBBE project Track_Fast. She is also editor-in-chief of the International Journal of Food Studies. Cristina Silva is past-president of ISEKI_ Food Association, member of the executive committees of EFFoST and IFA, member of: ISEKI_Food Academy, and Task-Force – “Growing the Bioeconomy” of ICA. She is currently responsible for the International Relations, coordinator of the 3rd cycle degrees, president of the pedagogic committee at ESB, and member of the directive board of CBQF. Araújo A.C., Oliveira S.M., Ramos I.N., Brandão T.R.S., Silva C.L.M. (2016) Influence of pretreatments on quality parameters and nutritional compounds of dried galega kale (Brassica oleracea L. var. acephala). Food and Bioprocess Technology 9(5): 872-881. DOI: 10.1007/s11947-016-1678-1. Fundo J.F., Amaro A.L., Madureira A.R., Carvalho A., Feio G., Silva C.L.M., Quintas M.A.C. (2015) Fresh-cut melon quality during storage: An NMR study of water transverse relaxation time. Journal of Food Engineering 167:71-76. DOI: 10.1016/j.jfoodeng.2015.03.028. Ramos B., Miller F.A., Brandão T.R.S., Teixeira P., Silva C.L.M. (2013) Fresh fruits and vegetables - An overview on applied methodologies to improve its quality and safety. Innovative Food Science and Emerging Technologies 20:1-15. DOI: 10.1016/j.ifset.2013.07.002. Ramos I.N., Brandão T.R.S., Silva C.L.M. (2015) Simulation of solar drying of grapes using an integrated heat and mass transfer model. Renewable Energy 81:896-902. DOI: 10.1016/j.renene.2015.04.011. Tremarin A., Brandao T.R.S., Silva C.L.M. (2017) Inactivation kinetics of Alicyclobacillus acidoterrestris in apple juice submitted to ultraviolet radiation. Food Control 73:18-23. DOI: 10.1016/j.foodcont.2016.07.008.